Vitalcast Digital Signage Solution delivers your business vitals directly to any plasma, LCD, rear-screen projector or other display so you can display your customized information at the right place and time. With Vitalcast you will be able to grab the attention of your visitors right from the start. Use the eye-catching digital signage screens in your entrance hall to show your guests wayfinding images and useful information about your company and facilities. An excellent solution to present your visitors with a professional and pleasant welcome from the very beginning. Combined with Quickcom, Vitalcast is designed to constantly provide your help desk & command center employees with relevant and timely information. This results in fewer misunderstandings and leads to better customer satisfaction. With our solutions your employees can communicate information in real-time, stay on top of the number of calls and monitor problems adequately. This creates real-time situational awareness amongst your staff. Vitalcast allows you to effectively manage communications designed for your staff. You can choose to display multi-media content, such as news feeds and corporate announcements, alongside your business information. Provide the daily specials menu in your cafetaria, or show an oversight of the weather forecast for your employees’ convenience. Your organization can use Vitalcast Digital Signage to design and set up professional advertisements that ensure customer response. Vitalcast is available in a wide range of formats and sizes, our digital signage and menu boards can be applied in multiple locations throughout your operations. Thanks to the high quality, colorful LCD and plasma screens, our digital signage and menu boards have exceptional visibility and memorability. Digital signage is an effective solution for sharing promotions, advertisements and information, both outdoors and indoors. Vitalcast is the ideal solution for creating and deploying new marketing offers in only a few minutes. Respond to changing market trends – and generate new sources of revenue. Static signage is expensive, time-consuming to produce and it gives you nonexclusive messaging, whereas digital signage can be changed endlessly. Create individualized site offers that meet the demands of different demographics, using test-and-learning marketing to increase sales earnings. Digital signage works with a wide multitude of media formats, including text, graphics, live TV, advertising and real-time weather updates. Add your logos and visual aids to create effective marketing and information to target your customers. Reduce the pressure on your personnel: present answers to frequently asked questions, like fuel prices, weather conditions or menus. Thanks to dayparting capabilities you can provide just the information that is relevant to customers’ needs at the particular time of day. With Vitalcast Digital Signage and Content Manager you can design professional content with just of few clicks. Solution experts provide drag-and-drop interfaces with which you can easily create, update and manage information. And, content can be managed on various screens. For petroleum and convenience retailers, Vitalcast Digital Signage offers the best of both worlds: an expandable platform with chain-wide control. Any employee can create and manage displays for multiple sites from a single workstation. 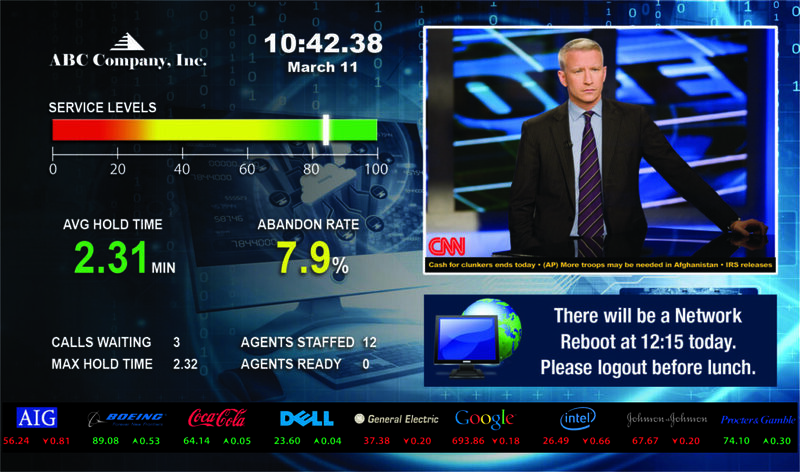 In the case of a network outage or malfunctioning media control, Vitalcast Digital Signage continues to operate. Increase the awareness amongst your contact center staff. Vitalcast, in combination with Quickcom, allows for instant retrieval of critical information from your data systems. Our digital signage solution provides your employees with information about the average answer speed, the number of calls in queue and the oldest pending call. You can easily customize the various forms of information output for different departments within your organisation (you don’t need an IT background! ), so every employee gets the right information to perform an excellent job. Do you need more knowledge on Vitalcast Digital Signage Solution? Download our brochure for more elaborate information on the correct uses of Vitalcast Digital Signage Solution or contact us for a demonstration.